Turn to nature for inspiration where every nook and corner is filled with rich vegetation. Here’s a good selection of shade loving perennial plants to beautify your problem areas. Astilbe, as one of the easiest perennials for shade, is the first choice to add color to a shady spot. It has a glossy, fern-like foliage, and brings year-round interest, except in winter. The color choices mainly lie in the pink spectrum, but you also have white and red-flowered astilbes. The flower heads can last up to several weeks. Astilbes are usually grown from divisions which are planted in spring or summer in rich, moist soil. Astilbes need a light cropping after all the flowers are spent. These low-growing plants have large, glossy green leaves that either remain green or display red fall colors, usually in colder regions. They are great for shade gardens, especially as borders or for growing under trees. The flowers are small and bell-shaped, but they appear in clusters which are held above the foliage on 1 ft long stalks. These plants need rich, moist soil to thrive. They do best in partial shade, because full sun can burn the leaves. This native woodland plant prefers shade and moist soil has attractive, and deeply cut leaves similar to astilbes. This plant can be grown from seeds, but usually, divisions are used. Plant them in spring in partial shade and keep the soil moist. The plants are clump-forming, and may grow 3ft to 6 ft tall, so make sure to choose the cultivars and location carefully. These small-leaved plants make great companions for other large-leaved plants in the shade garden such as hostas. You can grow columbines from seeds sown in spring. These short-lived perennials decline after 3-4 years, although self-seeding usually keeps your established stands going for several years. But it helps to collect some seeds every year for fall or spring sowing. The plants may grow 3 ft tall, and dwarf varieties are usually under six inches. Goat’s beard is an astilbe-like perennial plant which loves the cold and damp conditions of shady woodland areas. Coming out in great profusion early and mid-summer, they are great as cut flowers and can be dried for everlasting bouquets. You can grow this plant from seeds or divisions planted in spring or fall. It self-seeds under favorable conditions. Since each clump can grow between 3ft to 5ft in height as well as width, the planting spot should be chosen with care. Lily of the valley is grown in shade gardens for its fragrant, bell-shaped flowers that appear in spring. They are perfect for the shaded area under trees. Lily of the valley is grown from underground stems called pips. Handle the pips with care as they are poisonous to people and pets, like every other part of the plant. Provide sufficient moisture to young plants by covering them with a layer of mulch. Japanese Forest grass is a perennial grass with a flowing habit, ideal for shade gardens. This grass can be easily propagated by dividing mature clumps. Dig up an older plant in spring and divide it into 2-3 portions. Plant each division, giving it plenty of space to spread. Japanese forest grass is made for shade. So give them a shady, moist spot that closely resembles their natural habitat. Japanese forest grass can be grown in zone 4 with some extra protection and heavy mulching. Coral bells have green foliage, but you can get so many different varieties now, sporting colorful and variegated leaves. Coral bells can be grown from seeds, but it is a time consuming process that gives uncertain results. It is better to get ready made plants that you can plant out in the garden in spring. Divide older plants in spring to prevent them from dying out in the center. These amazing foliage plants come in a variety of large, attention-grabbing leaves that make a weed-suppressing carpet over the ground. Hostas can be divided in spring, summer and fall. Summer divisions should be watered well to prevent their drying out. Fall divisions should get enough time, at least, four weeks, to get established before the ground freezes over. Hostas do need your attention. They are prone to deer and slug attack since they find its soft, fleshy leaves delicious. Pachysandra thrives in acidic soil usually found under trees. The thick, spreading growth literally suffocates all other competition, so you will have a weed-free patch where pachysandra establishes itself. tiny flowers that appear in spring may not be very showy, but they have a lovely fragrance to compensate for this. Pachysandra can be propagated from divisions, or you can get flats from the garden center when you want to cover large areas. Plant them 1 ft apart to allow for their spread. It is important to keep the area shaded and the soil moist. You can grow pulmonaria from seeds or divisions of underground rhizomes. 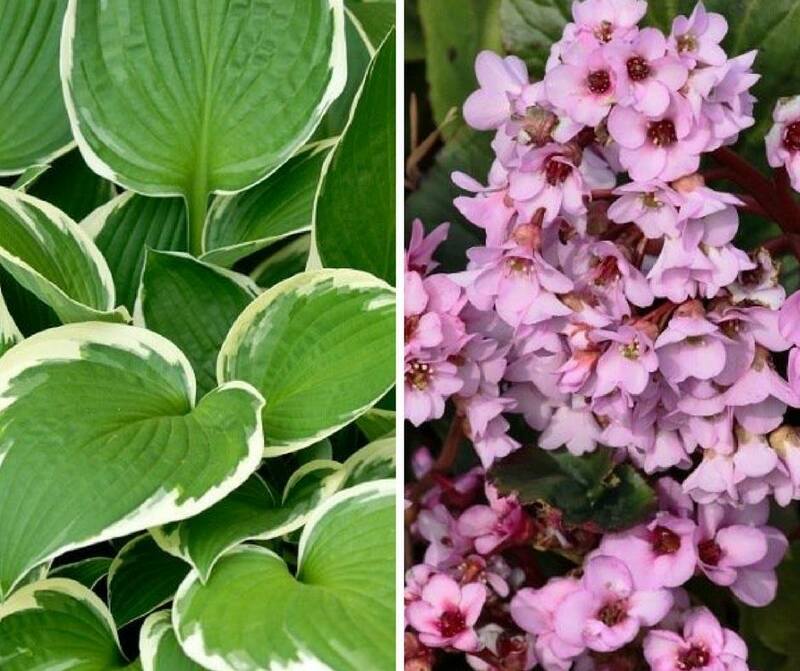 Plant them in a shaded spot with other shade-lovers like hostas to add a dash of color. Each plant will have a spread of 1 to 1 ½ ft, so space them accordingly. Keep the soil moist with regular watering. Light and water are the two most important factors for plant growth, so when both of these are denied, plants find it extremely hard. Fortunately, we do have some plants that can survive such inhospitable conditions. This herbaceous perennial forms a delightful groundcover in shady areas. Growing not more than 6 to 8 inches tall, the plants form a neat mat over the ground, under trees and around large shrubs. You can choose from a wide selection of flower and foliage combinations. Water the young plants regularly. Older plants can withstand occasional droughts, but water stress turns the edges of leaves brown. Lilyturf is another perennial with long and narrow arching leaves. Lilyturf is propagated by divisions of the clump. It is ideally done in spring in colder regions, but divisions can be done any time of the year in warmer areas. It appreciates regular watering initially, but can withstand drought and dry heat to a great extent once the clumps are established. The bush flowers of Japanese Yellow Rose profusely all through summer even in deep shade. You get plants that have single layered flowers that resemble old-fashioned roses while the double layered flowers look like chrysanthemums. The bright green serrated leaves and the green branches look good even when there are no flowers. There are variegated cultivars too. An occasional hard pruning helps maintain the bush in good form and promotes flowering. Vincas mainly come in two forms: Vinca major and Vinca minor, the former adapting well to sunny locations and hot climates. It is a perennial in USDA Zones 7-10 but treated as an annual in colder areas. Vinca minor, commonly called dwarf periwinkle, on the other hand, prefers shade. Both types are drought-tolerant once they become established, but flowering may be affected in dry conditions. There is no limit to the number of beautiful shade-loving plants you can use to adorn even the most difficult places in your garden.